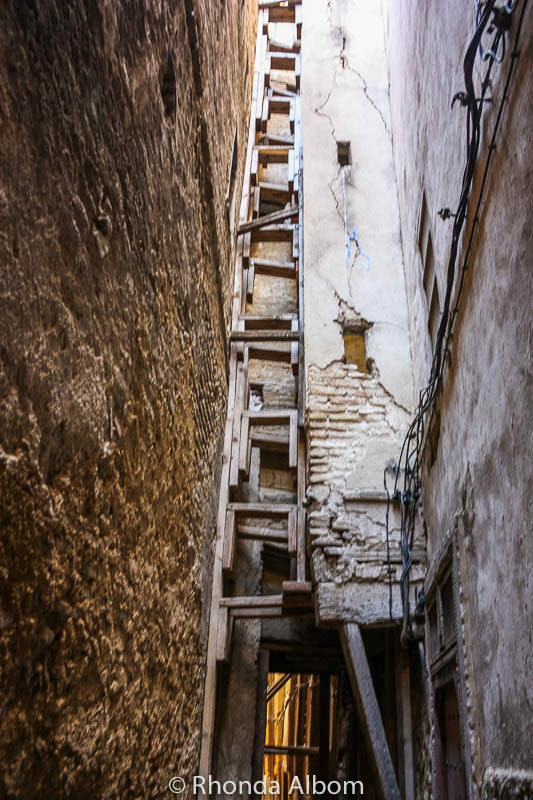 The old walled Fes medina is a labyrinth of narrow streets and dead ends like nowhere else. The former capital of modern Morocco, Fes is the country’s second-largest city. 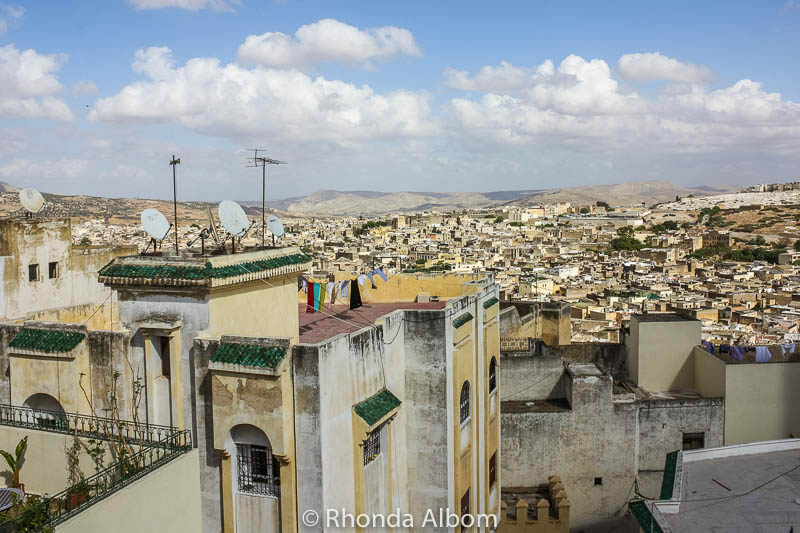 As one of the world’s largest pedestrian zones, the Fes medina is one of those places that people either love or hate. Its a place to wander, to get lost, and to discover. It’s an overload of colours, patterns, sounds, and unknown aromas creating endless things to do in Fes. Then there is modern Fes, outside the old medina offering a completely different feel and list of things to do in Fes. We liked Fes so much, we went back for a second visit. 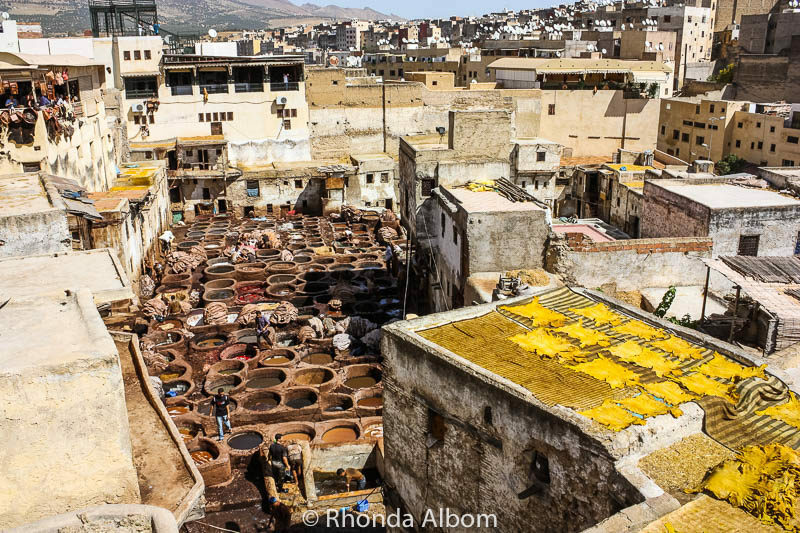 Let me take you on a photo exploration of the 1300-year-old Fes Medina, a UNESCO world heritage site. 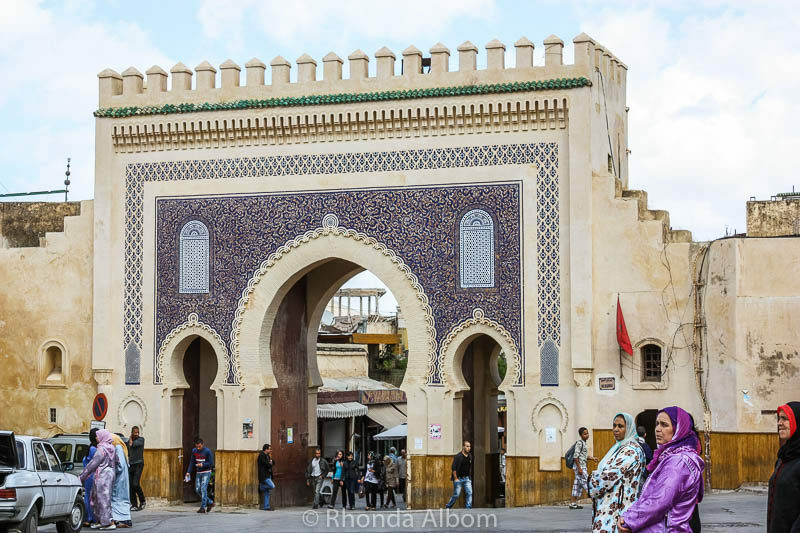 Bab Boujeloud, the French-made Blue Gate, is the largest and most famous entrance to the Fes Medina. The cars in the photo indicate that I am standing outside the medina. The other side of the gate is green. 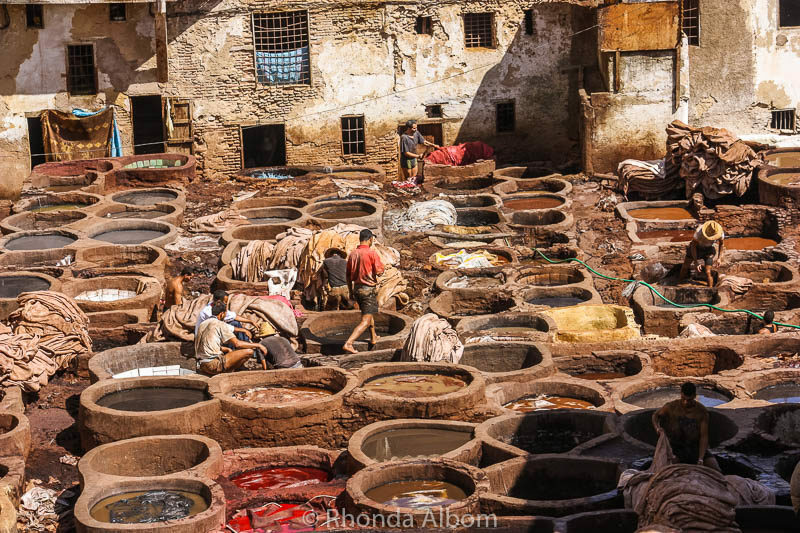 Chouara Tannery was built in the 11th century and is the largest of three tanneries in Fes. Here, the leather processing techniques are unchanged for a thousand years and utilise pigeon droppings, limestone, and other natural materials. It is best seen from above, as at ground level the stench is overwhelming. If you hold a mint leaf under your nose, it will help dissipate the smell. One of the more interesting places we visited was Chouara Tannery. A closer look at this Fes tannery, and we can see the skill that has been passed down since the 11th century. My best advice is to look up. Some of the intricate carvings are incredible. 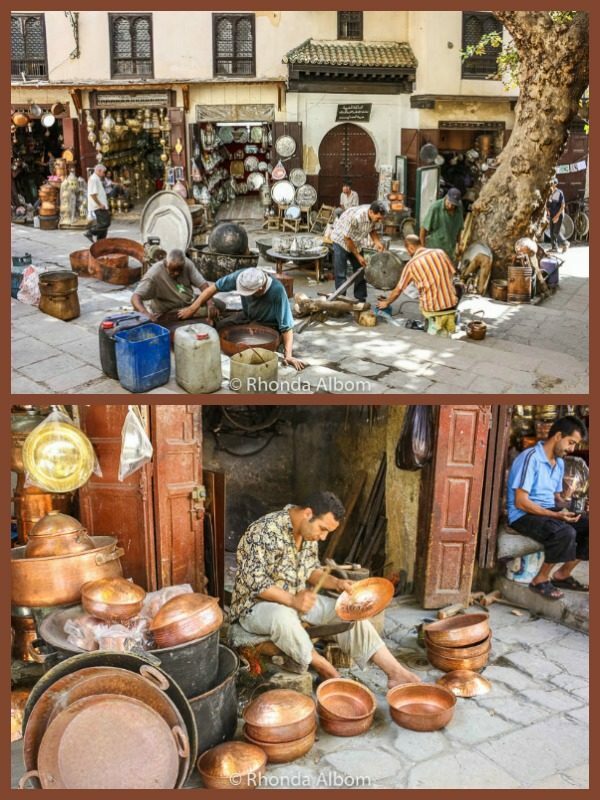 The Souk of the Carpenters is a cultural exploration filled with fascinating and talented artisans, whose skills have been passed down through the ages. Medersa al-Attarine is nearly 1000 years old and open to non-Muslims. 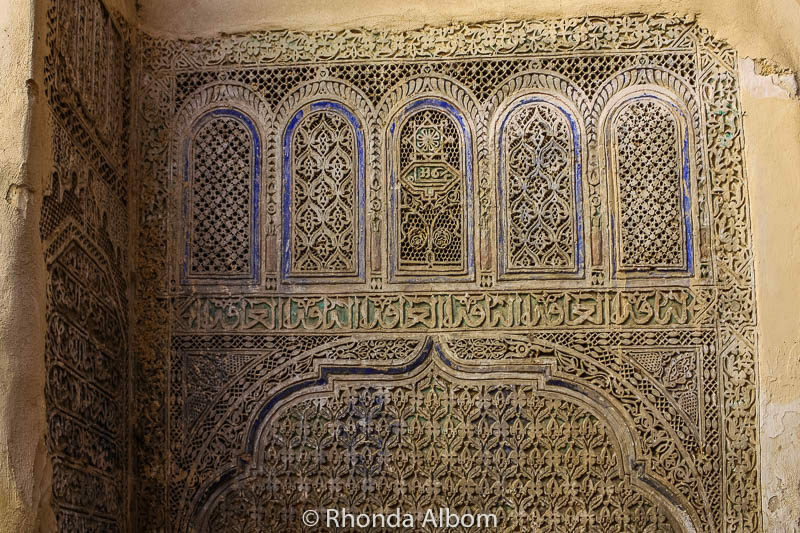 In contrast, the Andalusia Mosque, the Karaouine Mosque, and the entrance to the tomb of Moulay Idris are each intricately detailed, however, each of these is open only to Muslims. Wandering the maze of alleyways, we found this building being held up by its neighbour. 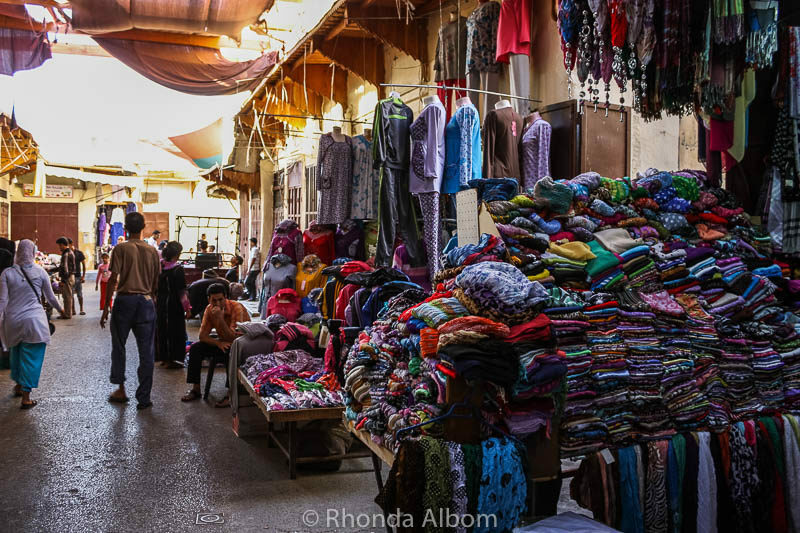 There are plenty of shopping opportunities in the medina. Remember to barter for the price. It’s a way of life, not an insult to your craftsman. 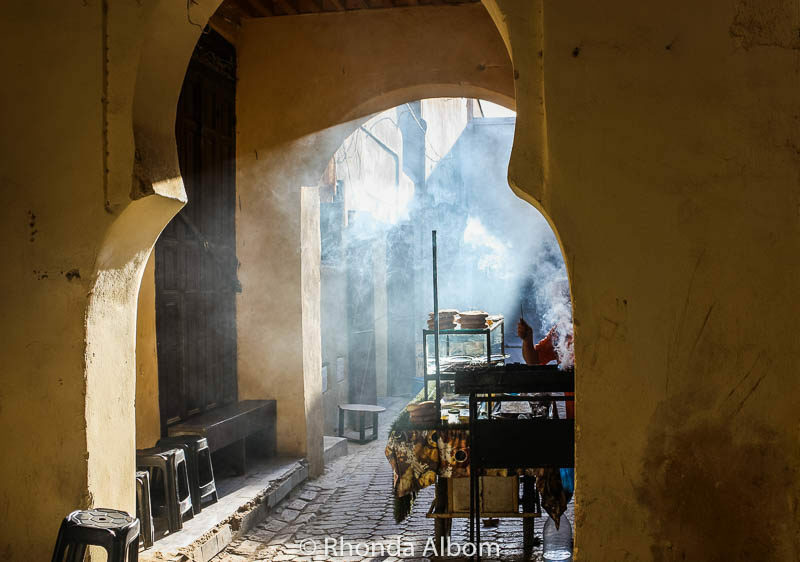 The aromas attracted us, but it was trying the new flavours that is one of my favourite things to do in Fes. Whether it be barbeque or sweets, we bravely tried most of it. We even had a camel burger in Marrakech. Our favourite place for dinner was Chez Rashid’s (not pictured here), a restaurant near the blue gate that was recommended to us. Learn from our mistake, even though the tables are out, if their metal shutters are down, the restaurant is not open, regardless of what a server tells you. I am not sure who served us our dinner that night, but it wasn’t up to standard. The aroma of barbeque lured us to this street vendor on one of the narrow streets of the old medina. More often than not we saw foods for sale that we couldn’t identify. This is smen, a salted and fermented butter. When they say fresh chicken for dinner, they are not kidding. 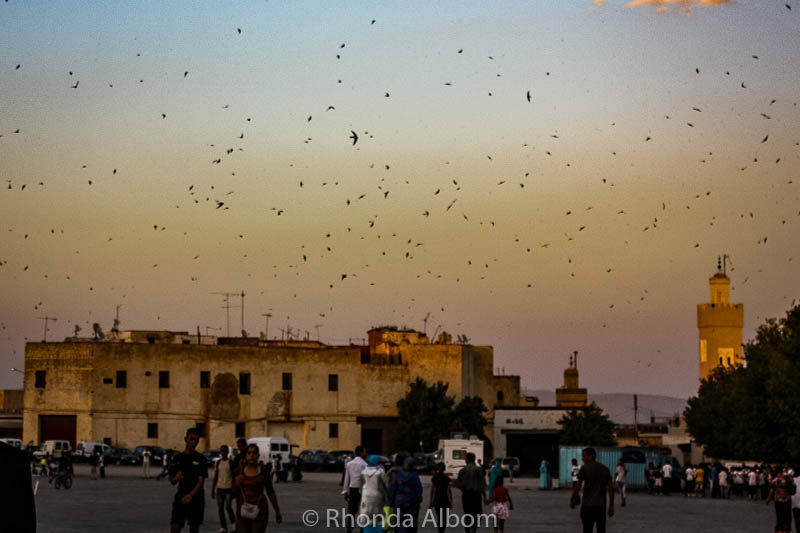 Every evening at dusk 100s of birds took flight from this section of the medina. We are not sure what this crowd of men was doing, but we think it was a storyteller like we saw in Marrakesh. A new friend invited into this home for a cup of mint tea. It wasn’t until after a month in Morocco that we learned there is up to six teaspoons of sugar in a cup of mint tea – no wonder it was so good! 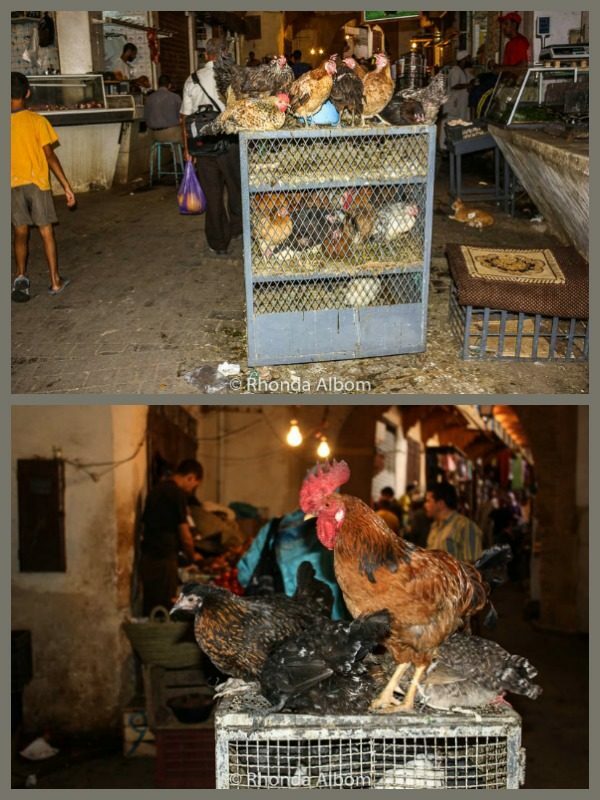 We quickly got used to sharing our walking space with the working animals in the medina. Visit the Palace Nejjarine, its beautiful fountain, and the Nejjarine Museum of Wood. Take a local’s hammam bath. 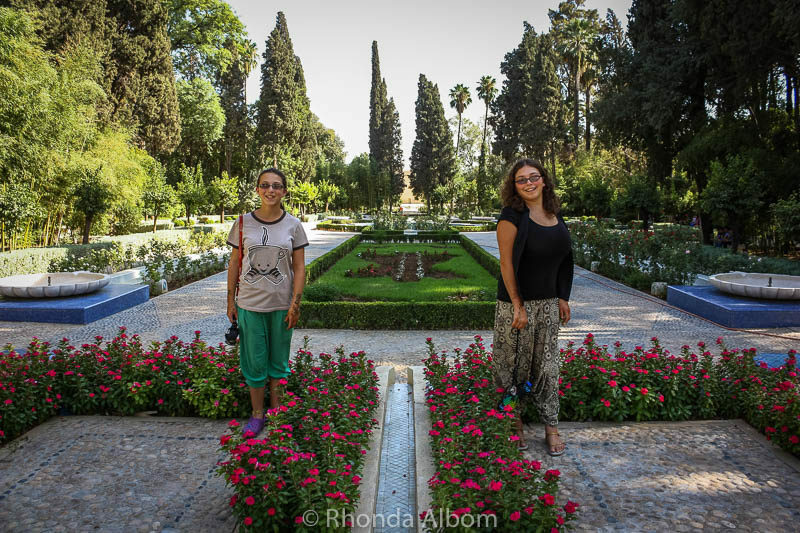 We opted to do this rather than the tourist hammam, and it was quite the experience. Also in the medina is the University of Al Quaraouiyine. Founded in 859AD, it is the oldest continuously functioning university in the world. We were lucky enough to arrive for the huge Moussem Moulay Idriss festival. If you don’t want to miss anything, take a tour. 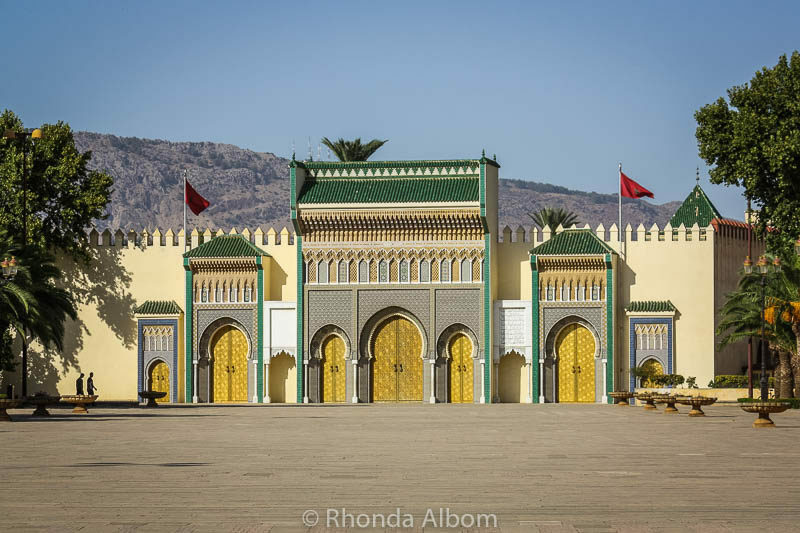 The Royal Palace Fes. There is a palace in each of the Imperial cities. Jardin Jnan Sbil is a quiet and peaceful retreat, an escape from the chaos, crowds, and vendors that fill the old medina. 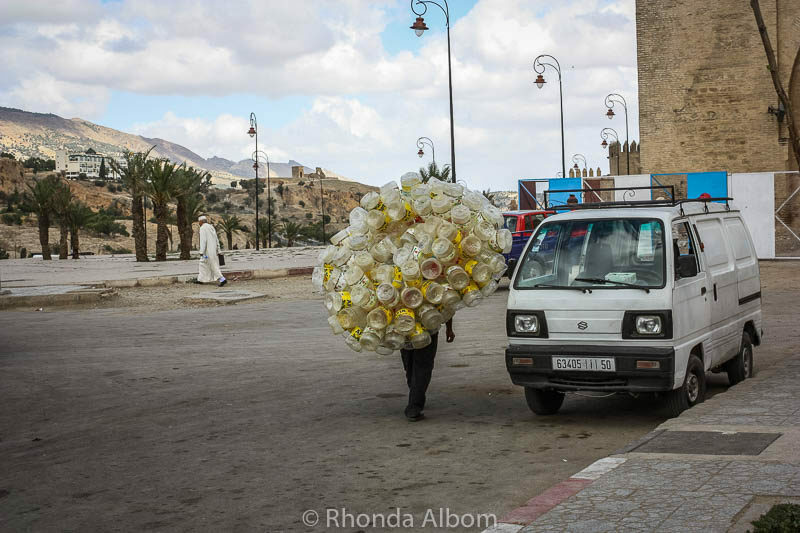 Outside the medina, we saw this man carrying empty water bottles. A rooftop lunch offered us this view of the city. Visit the district of the potters, Ain Nokbi. 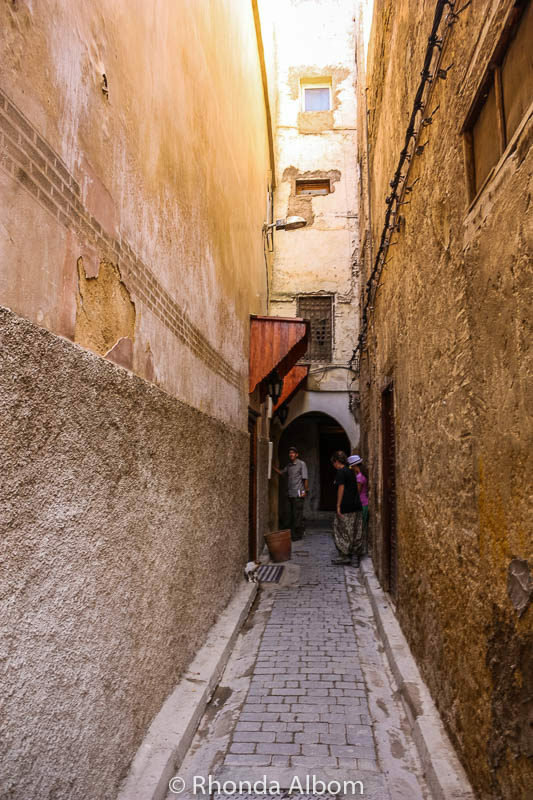 Take a walk through the narrow streets of the Mellah, the old Jewish Quarter. 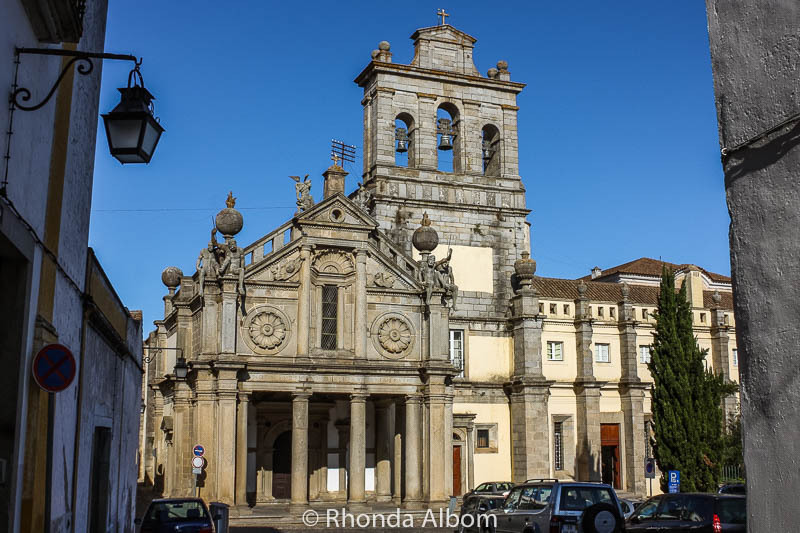 Stroll through the 14th-century Merenid Tombs (we didn’t go here). Three popular day trips from Fes are Meknes, Volubilis, and Moulay Idriss Each has their own distinctive personality. We opted to stay in Meknes for a couple of nights and visit the other two destinations from there. We stayed at Riad Al Atik in the old medina both time we visited Fes. 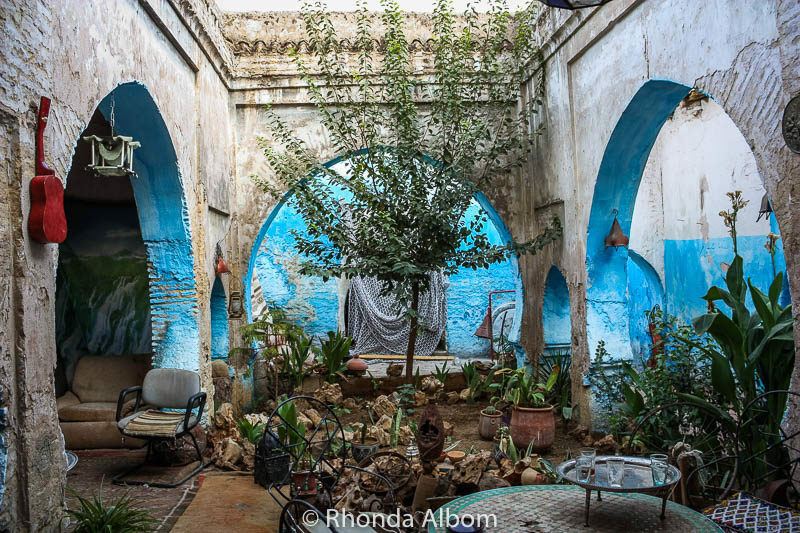 The attention to every detail, exotic and delicious food (be sure to try the homemade ice cream), and a friendly atmosphere make this traditional riad the ideal place to stay on any visit to Fes. And in traditional style, it’s not much until you enter. Then it opens with a beautiful courtyard, Moroccan doors, and Moorish archways. This dead end is the alleyway that leads to where we were staying. Like many old homes here, Riad al Atik is magnificent inside despite the plain exterior. 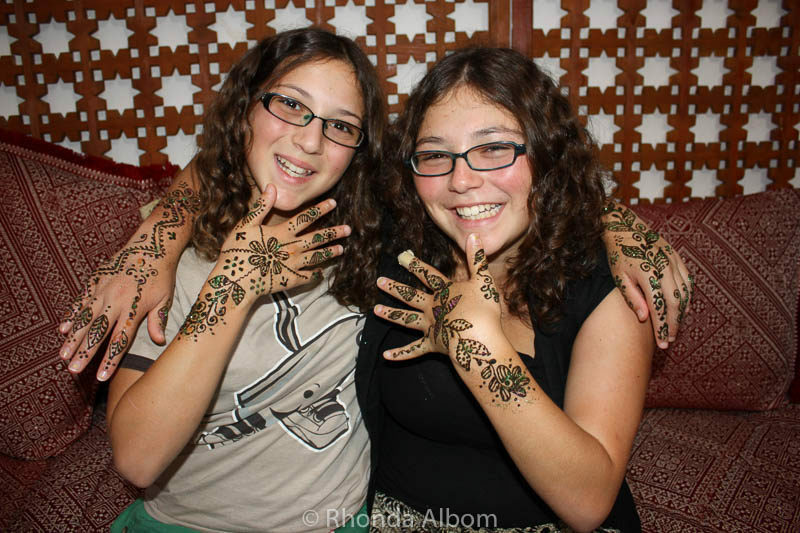 One of the women who works at the riad also does wedding henna. Our girls were very lucky to have her do theirs. 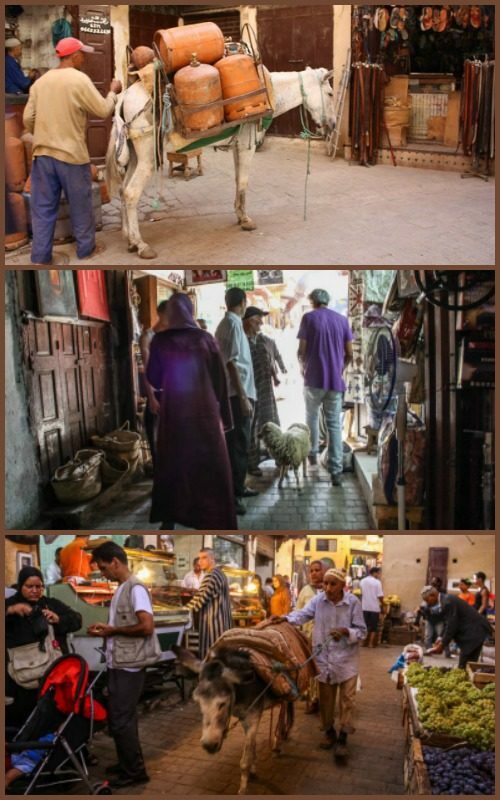 Many visitors get lost in the old medina. Before you hire a guide to find the exit, try walking uphill. Most of the medina alleyways head downhill to the centre. Take caution when drinking water. Always ask if it is safe for you to drink (the Moroccan’s grew up on it, and they can drink it without a problem). Also, if you buy bottled water, be sure you receive unopened bottles, rather than refilled. If you are outside of the medina, ask at your hotel or Riad how much the taxi should cost and don’t pay more – negotiate before you get in. 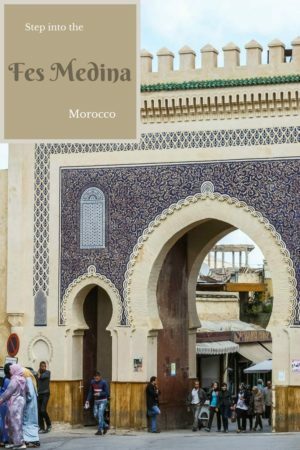 Have you been to Fes? Does the contrast between the old Fes Medina, and the new sections surprise you? I was just in Morocco last May! It was nice to be back and I will always love this place. Me too, I loved Fes, and would love to go back myself. I enjoyed Marrakech and Rabat also, but Fes is my favourite of the three. Rhonda, we always enjoy your photos, but never more than when you’re someplace we’ve been dreaming of visiting. These are fantastic pictures, and makes us want to speed up our timeline to Morocco! Thanks so much for sharing with us again on #TheWeeklyPostcard. Morocco is a fascinating place to visit, one of my favourite countries. I would encourage you to go, especially if it’s already on the bucket list. I love love checking out your photo stories. It’s a visual treat every time, and this is no different! Fes looks amazing. I love markets and would want to head there for sure. Thanks Reshma. I am blushing from your compliment. Fes is amazing, a city that makes it easy to get interesting photos if you just keep your eyes open. Some friends of mine visited Fes and they really loved it, so I’ve been wanting to visit it since then. I think I’d spend the whole time staring at the walls and carvings. The detail is so amazing! I don’t know there is so much to do and eat. I am think you should allocate extra time for staring. I would love to visit Fes – it seems like it’s one of the last really authentic, exotic places left in the world – your girls look so great with their Henna! I’ve seen photos of Chouara Tannery and it looks really interesting, though thanks for the tip on looking down from above! 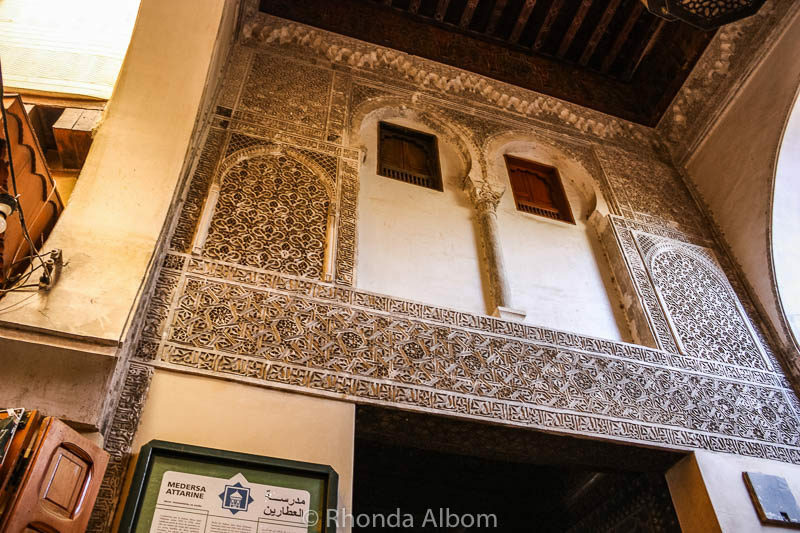 And for the tip to look up as you’re wandering around the medina’s – some of those buildings are so beautiful and intricate! We were really lucky to have that women do their henna. She normally does it for weddings. And it is true, the buildings are all lovely. Wow. I love the photo of the birds flying into the evening sky. So beautiful. I also love the home where you had the mint tea! It looks so peaceful. Thanks. I almost wish I had a video of it. Every night all the birds take off at once and circle. It is mesmerising. Thanks. Enjoy Fes. Stay in the old Medina if you can. great place to see in person. The tannery is fascinating and stinky. Best to view it from above, mint leaf in hand. Like something out of a movie to me! 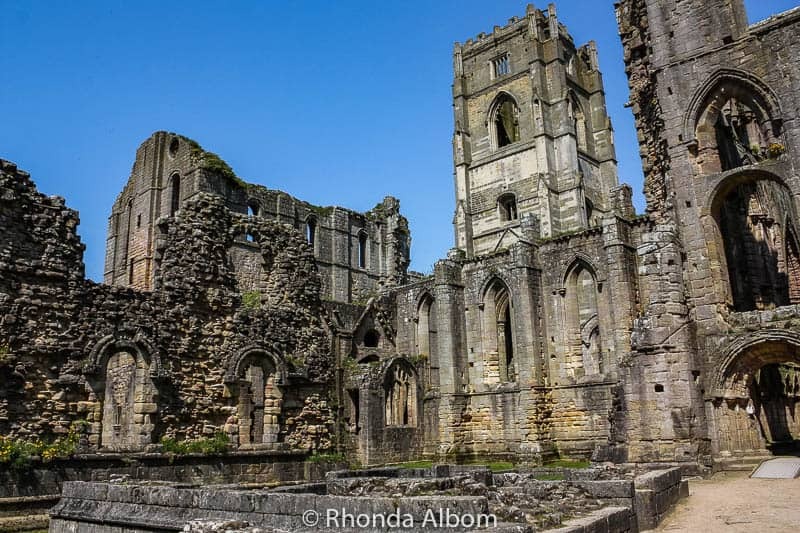 Beautiful travelogue … thanks for taking us along. LOL – it’s not a movie, but rather everyday life. Wonderful wonderful photos! I really love the one of the barbeque with the light filtering though the smoke. 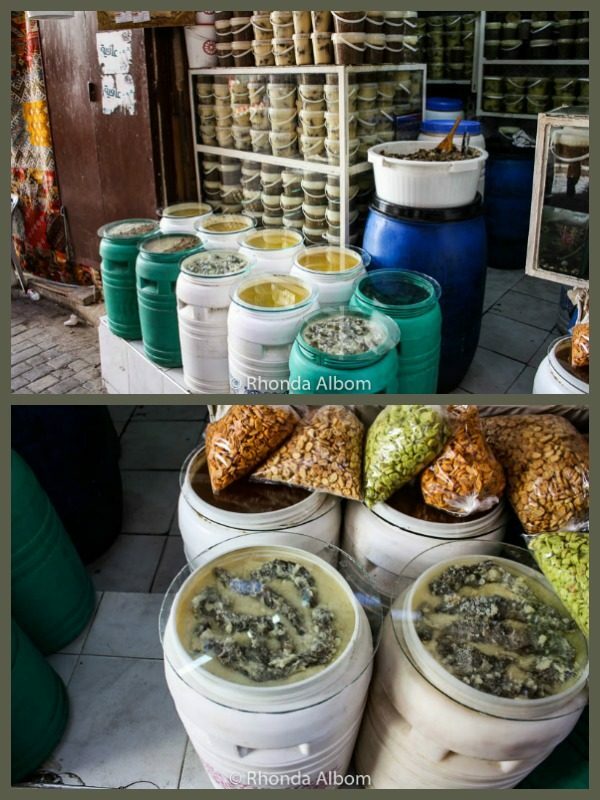 I’ve saved this post because I am dying to go to Morocco and need lots of tips! That is my favourite of the photos also. I hope you to experience Morocco, it is like nowhere else. How exciting. I would like to visit Fes. The blue house of your new friend looks gorgeous. 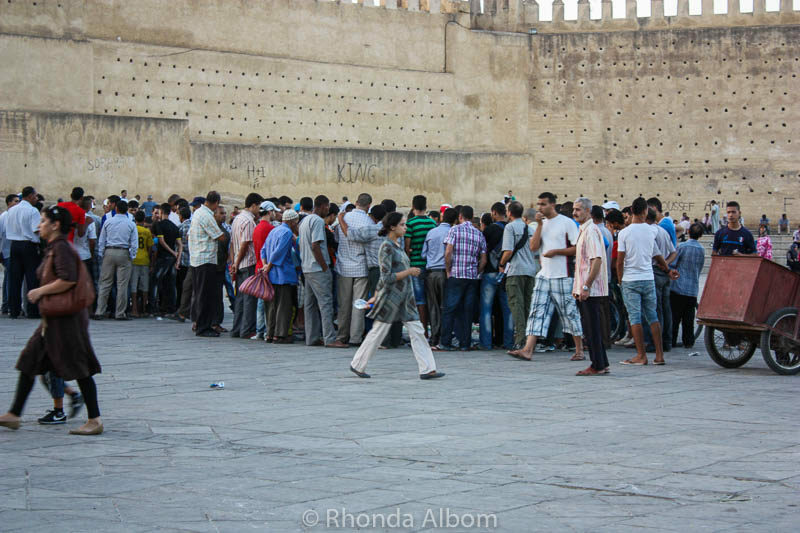 My favourite photo is of the birds swarming at night in the medina. The house was gorgeous. Many of the local homes there are like that, plain on the exterior, with a beautiful courtyard in the centre. Nice photos! I hope I can visit Marocco soon. I hope you can too. Morocco is such a fascinating place to visit. What an amazing adventure, experiencing all those alley ways and dead ends. The sights, the sounds and the smells? Such a wonderful adventure around every turn. We enjoy the adventure of stepping off the main road and exploring the back roads and side alleyways. Fes is the ideal place to do this. Very close to how Egypt is. Funny story about why the roosters sit on the tops of the cages, basically free to fly away. Their hens are kept inside the cages and the roosters won’t leave them. It’s their harem and they stay close to protect them from other roosters. They aren’t very successful at protecting them from being eaten for dinner though! That is a fantastic story about the roosters. No I haven’t been to Morocco but my husband was there in the late 1970s. Aah I could see myself sipping mint tea in your friend’s home in Fes. There is always a huge contrast between old and new, but I always find the old has much more character. I love the contrast between the old and new in Morocco, and yes the home’s courtyard was a lovely place to enjoy some mint tea. There are so many places to see in this world. Personally, Morocco was one of my favourites. Very cool photos. You and your family are truly fortunate to have seen so much of the world. I would love to visit Morocco one day! The architecture just seems stunning and there seems to always be something going on in the markets! Morocco is so interesting, the architecture, the culture, the food. We loved it all. The tannery smell was pretty overpowering. That BBQ archway shot is my favourite from Fes. As for the artisans, they are so talented, and I imagine they sit there day after day working their craft. Cool that we both chose the same guy to photograph. Thanks Carmen, that is the goal of my photos, to bring you along with me. Click on the link above, it will take you to the booking.com link to the hotel as it has so many photos. Yes, it was shockingly stinky. The mint leaves help, a bit. However, it is so fascinating, that I could ignore the stench. My vegetarian daughter didn’t do so well here. I love the picture of the bbq vendor. The smoke makes is so intriguing. That BBQ photo is my favourite as well. The hammam was an experience. Wow! How very exotic and different than anyplace I’ve been. It looks like it was an amazing trip! The Fes Medina was different than anyplace I had been. Being a pedestrian only area, there is a relaxed feel to it that I can’t capture in the photos. Such an amazing trip. I am loving the colours of this place and I wish I can visit it too! Morocco is a photographers paradise, loaded with interesting colours, textures, carvings and history. Incredible! Going inside is a totally different world. A fascinating world. I hope I get back there some day. Thanks. As for the Henna, take caution as to where you get it done. I can’t remember the details, but we were warned that some of the street vendor henna artists don’t use the same standard of henna. Great shots as always. I’m sure your girls will travel with their kids one day as you did with them. One will, the other doesn’t even like to leave Auckland very much. It’s not out of laziness in her case, she just doesn’t like the travel and would rather stay home. Will see what happens on our next trip. I think I may have mentioned before when you showed photos of these type places, I can’t seem to even think about going into countries and places like theses. I just feel scared even thinking about it. I give you a lot of power going there. I guess I’m just frightened. Thanks to you, a scared person like me can see places like this by a strong person like you Rhonda. Thanks for allowing me to see Morocco from your eyes. Glad I can share this with you. You got me curious, so I looked it up. For violent crimes, you are 29 times more likely to get murdered in the USA and similarly 6 times more likely to get raped than in Morocco. However, the overall crime rate is higher in Morocco. Wow! What interesting and amazing photos, like the one where one building was holding up another. EEEK! You must have had a difficult time narrowing down what photos you would use for this blog but you did well and gave a real feel for the place. What a wonderful experience for your children. You have no idea. There were over 200 photos that I liked. There were so many I even mad collages on this page. Oh, I’ve been to places where cats, roosters, and donkeys are always roaming…and it is so cool! Animal in foreign countires work hard right along side hardworking people. Such an exciting trip you are on!